The Music Informatics Research Group's (MIRG) Andrew Lambert is honoured by the Worshipful Company of Information Technologists (WCIT) for his outstanding contribution to the field of computer science. 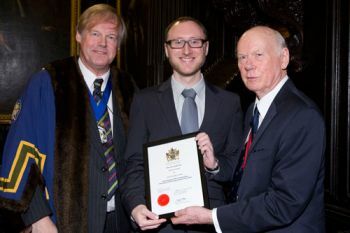 Andrew Lambert, a PhD student in the Music Informatics Research Group (MIRG) of the Department of Computer Science, was awarded a Silver Prize by the Worshipful Company of Information Technologists. The Information Technologists Company makes information and communication technology (ICT) accessible and usable to everyone; campaigns for the removal of barriers to accessible IT for all; and encourages greater professionalism in the design, assessment and support of accessible ICT. Andrew, whose PhD (supervised by Dr Tillman Weyde and Dr Newton Armstrong) focuses on oscillating networks for music generation, is the holder of an MSc in Creative Systems from the University of Sussex and a BA (Hons) in European Theatre Arts from Rose Bruford College. Music Informatics is concerned with research aimed at extending the understanding and usefulness of digital music data, through the research, development and application of computational approaches and tools.